In our household we have a long history of gardening. Frank grew up on a dairy farm in Central California and his family had food gardens almost every year. He remembers picking apricots, plums, and fava beans from their yard. Heather has always gardened, from helping grandparents with their gardens to converting the parking spot of her studio apartment to a garden oasis. Our children have always known gardening as part of life. They have helped create raised vegetable beds, built and painted the chicken run and choose plants to grow every summer. One year we grew an Atlantic Giant pumpkin just for fun. By October the pumpkin was over 5 feet in diameter and large enough for an adult to use it as a chair. 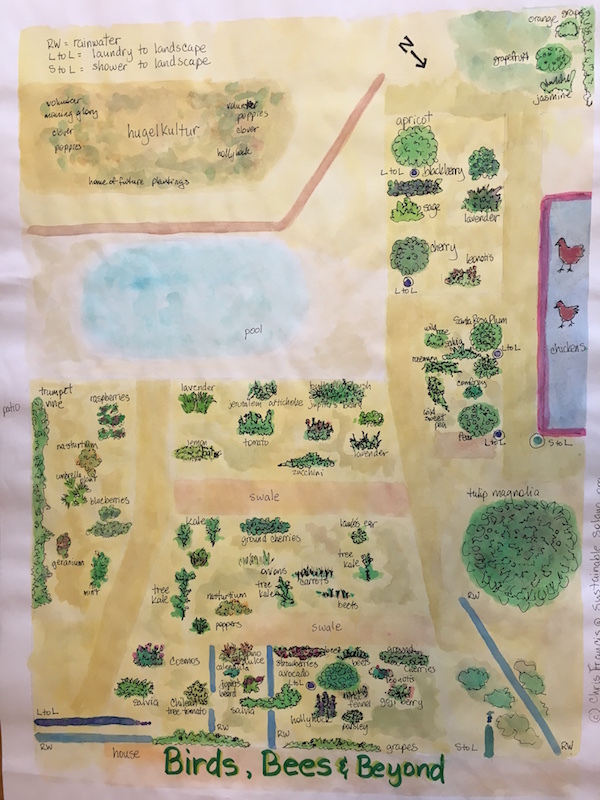 Heather is entering the Landscape Architecture program at UC Davis and will be taking her love of small scale gardening and applying that energy to large scale projects. Heather first learned of the Sustainable Backyard program at the Benicia Farmer’s Market last fall. After reading through the literature, we decided to submit an application to host a site. Truthfully, we didn’t know what to expect from the program. Permaculture was not a new concept for us, but we didn’t consider ourselves permaculture adherents. 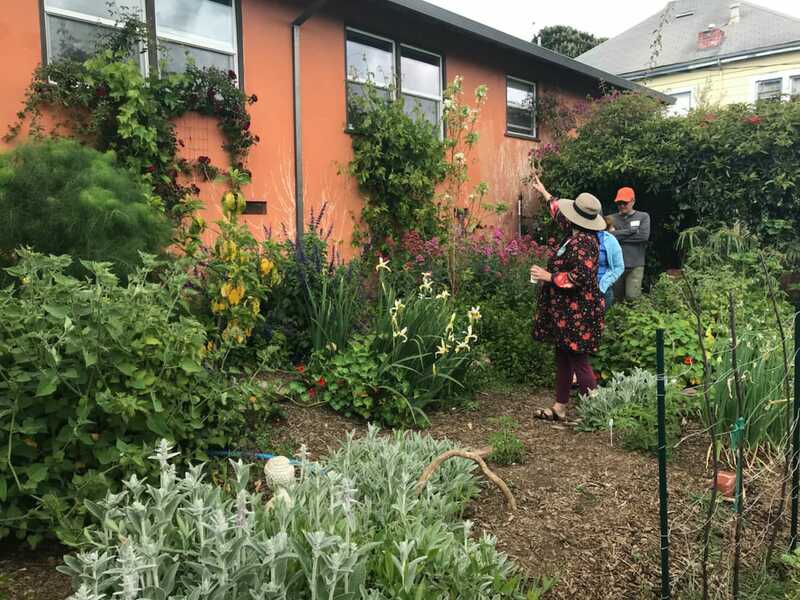 As we learned more about permaculture principles we realized that our garden and philosophy naturally fit the ideas of people care, earth care and fair share. We already want to provide our children with healthy, home grown food. We want to care for the earth as we do this, by constantly mulching and composting the waste produced by our garden. We also have practiced our understanding of Fair Share by sharing our garden harvest with our neighbors and people passing by. We hoped we would meet more people who shared our love of growing things and learn more about the Community Gardens network in our town. The installation was amazing. We have thrown many parties at our house, but the garden installation day was probably the best party this yard has ever seen. Before the installation we met with David Mudge to discuss our wants and needs for the space. He spent quite a bit of time in the garden, learning about the existing space. Heather had been making lists for weeks about yard tasks to be finished, food preparation and even art projects for the kids who might be at the event. We had hired a friend to provide childcare so both Heather and Frank could participate all day. The day of the event we had fresh coffee provided from Moschetti Coffee Roasters in Vallejo, fresh bagels from Safeway, muffins and fruit waiting for the participants. Our four-year old daughter was in charge of placing the chairs and insisted that everyone would want to sit in one big circle. She got over being wrong. Around 8:45 volunteers began to arrive. It soon became clear that this was going to be big. David spent some time describing the rainwater diversion design and then Elena welcomed everyone. Soon the pickaxes and shovels were flying and before long there was a swale. The digging continued until about 11 AM when more snacks came out. By noon everyone was ready for lunch. Frank barbecued and Heather brought out all the sides. It was a beautiful break in the day, to sit with people who had bonded over hard labor in our yard and talk about all the pressing issues of the day. Talk of the drought dominated conversation and the entire group was so very passionate about educating the public on grey water use and rainwater storage and diversion. We also celebrated Rick Beeson’s birthday and Heather and Frank’s Anniversary. The afternoon was devoted to plumbing the downspout diverters, planting the trees and filling the swales with mulch. More snacks were brought out and by around 4:30 we had a pitcher of sangria on the picnic table. By this time Frank and Heather were exhausted, even without doing all the digging themselves. The volunteers had come and gone as the day went by and eventually it was just our little family. In the future we plan to be part of the twice yearly BCG Sustainable Backyard tour. After hosting the installation date and the grey water program we know we can handle a large group. Our back yard now seems like our space, as we have completely changed the landscape from what it was when we moved into the house over 5 years ago. We plan to continue keeping chickens as they form an integral part of our backyard ecosystem. We have a giant hugelkultur bed now that will probably be where the chicken coop and run move to next year. The front yard now has the raised vegetable beds and will continue to be converted to a food producing and habitat creating space for pollinators. Frank has grand ideas of rainwater diversion to the front yard upslope and possible plans for bath grey water use. We would love to host more events and have our house become a demonstration area for many different aspects of gardening and permaculture. See a gallery of Birds, Bees and Beyond photos here.